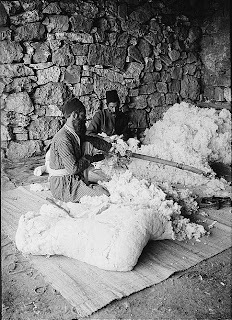 The caption on this picture from the Library of Congress' American Colony collection reads "Jews Carding Cotton" sometime around 1900 in Palestine. What does carding cotton mean? How is it done? Carding is a process of taking unprocessed fibers, such as wool or cotton, and untangling, cleaning and mixing the strands. When done manually, carding was usually done with a brush-like tool, or "card." In the 18th and 19th centuries machines were invented to card fiber. Historian of science Joseph Needham ascribes the invention of bow-instruments used in textile technology to India. The earliest evidence for using bow-instruments for carding comes from India (2nd century CE). These carding devices, called kaman and dhunaki would loosen the texture of the fiber by the means of a vibrating string.